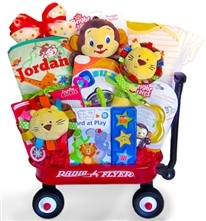 This absolutely adorable gift is a perfect way to welcome a new baby, or to say happy birthday or feel better to a special little girl! The sweet doll is a great companion for little girls and is entirely made from fabric, yarn and soft filler. Even the eyes are embroidered! 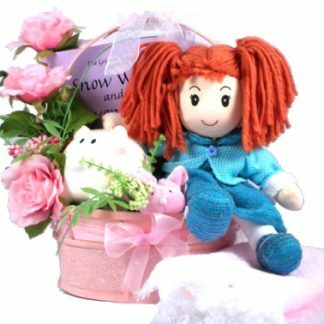 She is perfect for a newborns first dolly or a little girls “baby” She will make a very special friend! She arrives alongside a ceramic piggy bank complete with hand-painted flowers, a boo-boo bunny, with a unique cold cube for helping with all those little boo-boo’s little girls inevitably get, a beautiful soft pink blanket for snuggle time and a classic hardcover book! 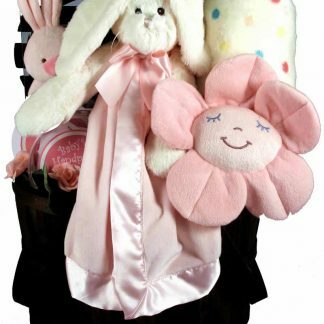 Complete with silk flowers and a wonderful pink basket, this gift is as cute as a button!Add A Big Brother / Big Sister Bear Want to make sure that an older sibling feels special too? What better way than to add a Big Brother Baxter bear or a Big Sister Betty bear. 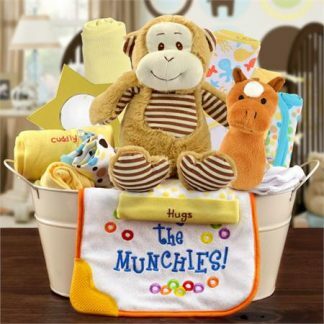 These adorable plush bears are a nice way to ensure older kids don’t feel left out when the new baby arrives.